Which Outdoor Additions Provide the Best Returns on Investment? Summertime is the best time of the year to spend outdoors in this part of the country. That said, it helps if you’ve got some cool outdoor additions to your property, and it’s even better when those additions add value to it. What are some of the outdoor additions providing the best ROI (return on investment) these days? If you’re thinking about less lawn and more trees, you’re in line with the trend. People don’t want so much grass to cut anymore. 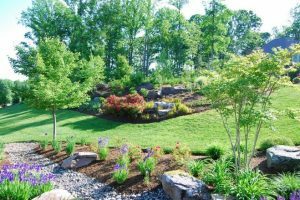 Instead, they appreciate low-maintenance vegetation and planting beds of perennials. Furthermore, the more trees, the better. Trees appreciate over time. Did you know a landscaped patio helps raise the value of your home by 12.4 percent according to SmartMoney.com? That patio is essentially an outdoor room that can be used as a dining area as well as a place to relax or for a kids play space. If your “back deck” abuts the family room, that’s ideal. If you like cooking outside, don’t be afraid to invest in an outdoor kitchen set-up on your property. These kitchens can include fridges, sinks and grills. If anything acts as a status symbol today, it’s having a backyard outdoor full kitchen. On the low end, you can have a fine one for $15,000, though some people spend upwards of $100,000 on one. Just having an outdoor kitchen, no matter what the cost, helps set your property apart from others. It’s got good ROI. Water features are always popular and add value to your place. Instead of a swimming pool, go with a hot tub. If that’s not your thing, invest in a small pond and/or a fountain, which helps beautify your yard, making it more peaceful and tranquil– a sanctuary, if you will. Landscape lighting is a good investment. Lighting that runs on solar power and shows off your garden and trees at night not only helps keep burglars away, but also illuminates the yard in a nice way. Finally, consider sprucing up your landscaping with things that’ll add color, especially during the drab winter months. How about flowering shrubs, colored bark, ornamental grasses and/or colored berries? These all add color to an otherwise plain yard. Even something simple like adding hedges helps boost your property’s value. Want to improve your yard? Have VistaPro help! Use our contact page here.